Here is a little game for your guests to play on a wet afternoon, when they are marooned in your drawing room. They will need to sit down with a piece of paper each and have their Mont Blanc fountain pens at the ready – preferably next to a crackling fire, and perhaps with glasses of decent malt whisky by their sides. The task you will set them is to list the features of the ideal English country house. After a decent time – and before they have all dozed off – you should award ten points for each mention of the following features: architecture by Robert Adam, parkland by ‘Capability’ Brown, wood carving by Grinling Gibbons (brought in from an earlier property, of course) and interiors by Charles Mewès and Arthur Davis. If any of the contestants also knows where all these blessings are to be found in one glorious property, he or she should be awarded a further one hundred points and given the rest of the bottle of scotch. It means that this person has probably been to the magnificent Luton Hoo Hotel. 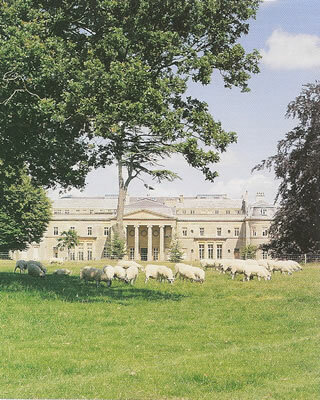 In the 1760s the third Earl of Bute commissioned Robert Adam to build a new house and ‘Capability’ Brown to re-design the 1,000 acres which surrounded it. 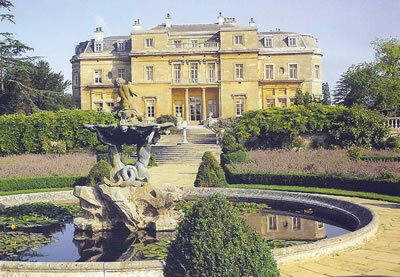 Thus was born Luton Hoo. (‘Hoo’ is a Saxon word, which means the spur of a hill.) In the 1840s the house suffered a terrible fire, which left little more than the walls standing. It was re-built, and then, around 1910, its owners – Sir Julius and Lady Alice Wernher – brought in the architects of the London Ritz , the brilliant Mewès and Davis, to provide them with rooms sufficiently grand to receive the most notable persons of the day. Now, after a restoration by Elite Hotels costing £60 million, it has opened as an hotel of remarkable splendour. I must make one recommendation at once. Do stay in the main house, as I did. Some of the hotel’s 144 rooms are in the annexes – all cleverly hidden in the grounds, next to the indoor swimming pool, the 18-hole golf course, the spa and the tennis courts. Doubtless, these rooms are very comfortable and have (unlike those in the mansion, for it is carefully protected by the authorities) air conditioning. But there is no substitute for staying in the great house itself. I would also suggest that – again, like your correspondent – you opt for one of the more expensive rooms, for they are certainly worth the extra pennies. 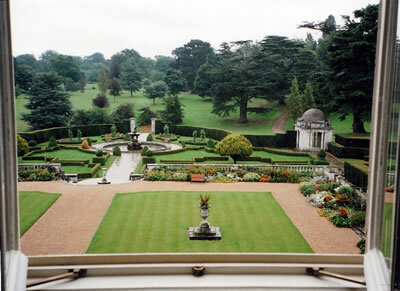 My apartment, number 9, was on the first floor and had a captivating view of the formal garden (pictured) and its exquisite stone lodges. This was a ‘Master Bedroom’ and was therefore £525 a night, bed and breakfast for two. Through a small hallway, a second door gave onto a green and beige room of elegance and proper proportion. Indeed, for a short stay, I would suggest its measurements – 20 feet by 16 feet, with a height of 12 feet – were well nigh perfect. 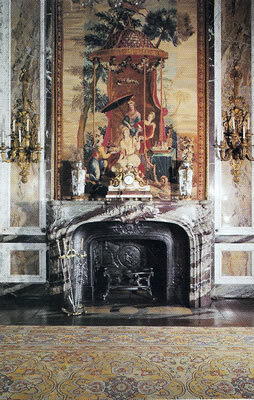 Its crowning glory was the fireplace, with an original surround designed by Robert Adam himself. 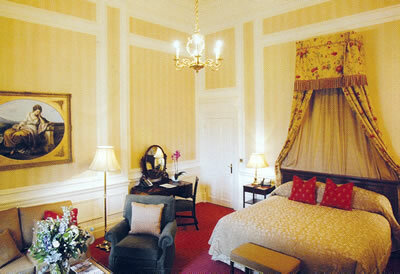 (Of how many hotel bedrooms can one say that?) I also particularly liked the curved woodwork of the fitted wardrobe, another period feature. A sofa, an easy chair, four table lamps, heavy damask for the curtains and for the canopy over the beds and various pieces of mahogany furniture in the Georgian style maintained a high degree of both style and comfort. Within the walk-in wardrobe (behind another door) were my personal safe and those items which are too seldom found in the grander English hotels: coffee-making facilities and an iron and an ironing board. (Yes, I know that room service can be called and that hotels will press clothes for their guests, but just occasionally I like to do things for myself.) Up one step was the bathroom, a large white room lit by spotlights, with two wash basins, a corner tub, a separate shower, soft white towels and Molton Brown toiletries. Here, too, was a pretty oval window, which revealed the impressive thickness of the house’s outer walls. In my room was a modern painted copy of an original portrait of some members of the previous owner’s family. Indeed, throughout the building, great care has been taken to reproduce the paintings which originally decorated its walls. 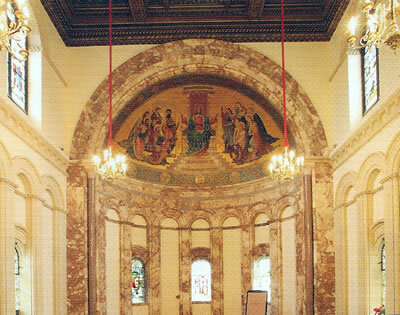 (Many of the originals can now be seen at the Queen’s House at Dulwich.) I can understand why this has been done, but I found these reproductions not to my taste. I was delighted to find, when I was taken on a tour of the house by the delightful Zena Dickinson, that the former chapel – created in the 19th century by one of the finest architects of the day, George Edmund Street – still has the original stained glass in its windows and the splendid painting in the half-dome of the apse of Our Lord with several saints. Among the holy ones, I was able to identify Saint Stephen (with a rock) and Saint Peter (with keys). 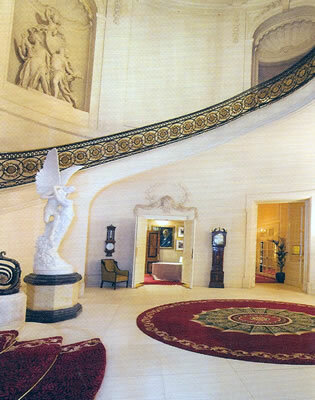 To be able to wander around the public rooms at Luton Hoo, with even that modest sense of temporary ‘ownership’ conferred by my status as a guest at the hotel, was a real privilege. In the Great Hall, the Pillared Hall and the sweeping Staircase, Mewès and Davis created masterpieces of the Belle Époque: they inspire confidence and joie de vivre. And then there was the long Drawing Room – wherein I enjoyed afternoon tea – which still survives in the more restrained Adam mode. I was greatly looking forward to dinner in the Wernher Restaurant, the most ravishing of the Mewès and Davis rooms and formerly the State Dining Room of the mansion. I struggled with my collar studs, but every ounce of sartorial effort was worth the making, for this is a gorgeous setting in which to eat. (If you know the restaurant Les Ambassadeurs at the Hôtel Crillon in Paris, you will have a measure of the sumptuousness.) 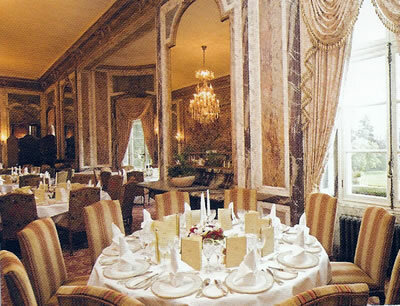 Walls covered in fine marble, mighty crystal chandeliers, enormous tapestries and heavy wall lights in gilt bronze combined with candles and napery of pure white to raise my gastronomic expectations to the heavens – as did the attentive service provided by the Restaurant Manager, Chris White, and his team of formally-dressed waiters. Executive Head Chef Kevin Clark offers a set lunch at £30 and a set dinner at £42. I chose four courses from the carte (for £59). The emphasis here is on English food. The ingredients are of high quality and the standard of both the execution and the presentation is praiseworthy. My opening goat’s cheese, wrapped in cucumber and served with English asparagus and minted yoghurt, was as refreshing as it was pretty. Next came a pressing of foie gras and confit of chicken, with pears in port, celeriac and pickled mushrooms – a well-judged balance of flavours. My meat was superb – really flavoursome rack of lamb, herb crusted and beautifully cooked – although the accompanying sweetbread sausage and the fierce demi-glace sauce were rather distracting. Then my meal ended with a real flourish, with a pudding which made me purr with pleasure – coconut sticky rice, with caramelized pineapple and passion fruit gratiné. Delicious. The glassware in the Wernher Restaurant is cut crystal. This is certainly attractive, but it is not ideal for drinking wine, as it obscures the colour and is usually wrongly shaped for ‘swirling’. The list contains helpful notes on all 265 wines. The cellar is not a treasure trove of the greats, but it does offer a sensibly chosen selection from the New and Old Worlds. Prices range from £25.50 for a South African chenin blanc to £452 for the 1988 Haut Brion. Many bottles are in the range of £40 to £80. The following bottles caught my eye: 1998 Latour (£250); Krug Grande Cuvée champagne (£224 – but note that half-bottles are £97); from Spain, 1995 Vega Sicilia Unico (£273.50); from Australia, 1999 Grange (£340); and from New Zealand, 2005 Cloudy Bay chardonnay (£45.75). I went to Argentina for my white and to Sicily for my red. Torrontes is an Argentinian grape which I had not met before. Here was a wine which had the floral characteristics of a gewurtztraminer, but which – in the mouth – was much crisper and more acidic (Alamos Torrontes, 2006 - £28.25). There was certainly not much acidity in the Planeta merlot, a wine which I have appreciated on numerous occasions. This 2003 vintage (£48.25) was plump, fat and full of blackcurrant and liquorice. I returned to the restaurant the next morning for breakfast, but this time I went to a table in the adjoining room – a light, sunny chamber with a view of green lawns sloping down to the lake. Here, next to the carvings of birds and flowers by Grinling Gibbons (brought here from another house), I took to my table from the buffet mushrooms and lovely, old-fashioned sausages and dishes of raspberries and excellent fruit salad. There was also particularly good honey in the comb on offer. Jamie, the jolly waiter from Loughborough, ensured that my coffee cup was kept full. This was a civilized start to my day. A three-course set meal is offered for £28, and the all-day breakfast is £15.50. My three courses were £40.75. The food is simple, straightforward and carefully prepared and delivered by friendly staff. Pressed ham hock and parsley terrine, with apple and raisin compote, had a pleasing, rough texture. Rib-eye steak, with chips, stuffed tomato, field mushrooms and Béarnaise sauce, was tasty, properly cooked meat. And my concluding passion fruit and mango sorbet was first class. I clambered into the Silver Cloud, happy that, if I ever find myself playing the parlour game with which I began, I will have all the answers. For I have found the ideal English country house. 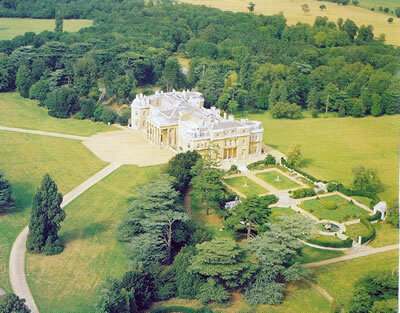 It is Luton Hoo. 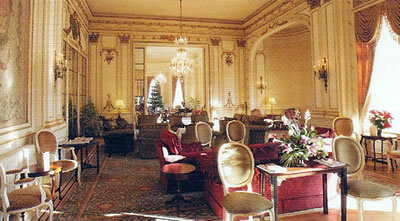 The Mansion, Luton Hoo Park, Luton, Bedfordshire LU1 3TQ, England.